Getting back from a week away on vacation is hard enough… but trying to fit back in to your work clothes after all that good eating and drinking is the worst! For my first cook after family vacation I wanted to cook something healthy but full of flavor. Recently, my better half (AKA Mrs. Buddha), introduced Cauliflower “Fried Rice” to our dinner rotation. This twist on classic fried rice substitutes the rice for cauliflower that has been pulsed in a food processor. Cauliflower “fried rice” is really delicious and a terrific way to cut the carbs from your diet. For this cook I wanted to do a shrimp dish paired with the Cauliflower “fried rice”. After settling in I took inventory of the ingredients I had on hand and went to the store to pick up a few additional things for this meal. So, sit back, grab yourself a glass of Riesling, and enjoy this post for Big Green Egg Korean Shrimp Skewers. 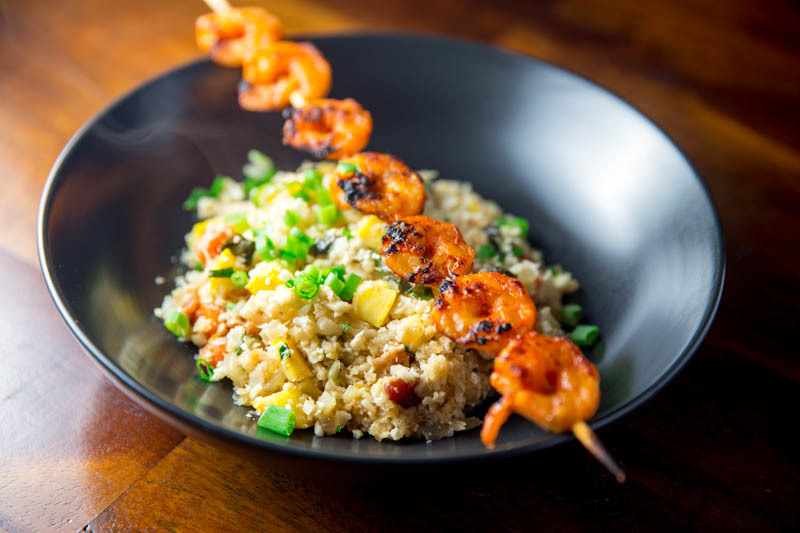 Korean Shrimp Skewers over Cauliflower “fried rice”. For the spicy Korean marinade I grabbed Rice Vinegar, Soy Sauce, Gochujang, Garlic, and Ginger. I also used a little Sesame Oil (not pictured). I mixed the ingredients together to form the paste to marinate the Shrimp. I added the marinade to the shrimp and mixed well. Then I let the shrimp sit in the marinade for 30 minutes. After the shrimp marinated for 30 minutes I skewered them using wooden skewers that had been soaked in water. For the Cauliflower “fried rice” Mrs. Buddha used Bacon, Cilantro, Fish Sauce, White Onion, Yellow Squash, Carrot, Basil, Soy Sauce and Cauliflower. I preheated the Big Green Egg to 400° and placed the shrimp directly over the flames. I cooked the shrimp for about 5 minutes per side or until they turned opaque. I served each skewer with a bowl of the Cauliflower “fried rice”. This dish was super delicious, healthy, and easy to make! This recipe for Korean Shrimp Skewers and Cauliflower "fried rice" is easy, delicious, and healthy! The perfect dish to serve when you are looking for a spicy alternative for your next meal. Mix the garlic, ginger, Rice Vinegar, Soy Sauce, and Gochujang in a bowl until smooth. Let the Shrimp sit in the marinade 30 minutes to 1 hour. Skewer the Shrimp on wooden skewers that have been soaked in water for 30 minutes to an hour. Preheat the BGE to 400°. Cook the shrimp direct for 5 minutes per side or until they turn opaque. Serve with the Cauliflower "fried rice". This recipe for Cauliflower "Fried Rice" is a healthy low carb alternative to your typical Fried Rice dish. Replacing the rice with pulsed Cauliflower is the perfect trick that makes this dish work! Fry the bacon in a heavy skillet and remove to a separate plate. Sauté the onion in the bacon grease until almost soft. Add carrots and squash and sauté until almost cooked through. Add herbs, soy sauce, fish sauce and stir well. Stir in bacon before serving. yummy!!! I was looking for a recipe to make on the grill this weekend and this is perfect! Thanks for the post Ana! Let me know how it turns out for you ! That looks amazing! I simply love cauliflower rice and Asian food! Thank You! At this point it will be hard for me to go back to regular rice! These skewers look awesome. So healthy and flavoursome! I never have made cauliflower rice before and after seeing this recipe I am inspired too. Thanks. Thanks Thalia! You will absolutely love the Cauliflower Fried Rice. It is now a regular part of my cooking rotation!